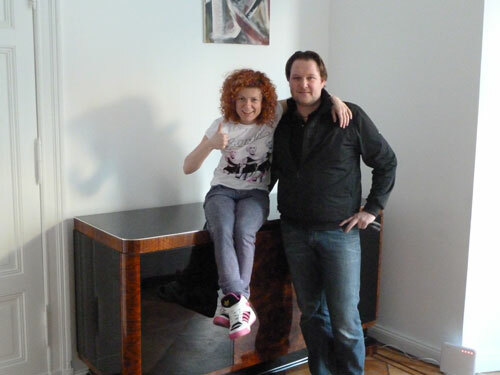 In the last week of February 2012, we had the opportunity to deliver our furniture to Lucy Diakowski from the famous German Girls Band “No Angels”. We presented the singer a black Bauhaus desk and a large Art Deco sideboard with rosewood doors and rounded edges. Lucy chose both unique furniture pieces a few weeks earlier from our website. A few weeks previously, Lucy moved in her penthouse in Berlin and was looking for exceptional furniture pieces with eye-catching effect. “The style of the finishings of OAF totally inspired me and I am very happy to have found this company,” said the singer. Lucy was very pleased with the two individual pieces, as one can see in the photos. She even promised to support OAF with whatever she can do with her prominence in Germany.